A1 Choice Plumbing is available 24/7 to handle all of your residential and commercial plumbing services, drain cleaning, sewer repairs, camera inspection and line location, heating and gas fitting requirements (including BBQ hook-ups), sump pump shenanigans and associated maintenance. Our professional and experienced crew never charges overtime or extra for emergencies, holidays or weekend services. With offices located in Kelowna and West Kelowna, we are only a phone call away. Our dedicated team is committed to providing honest quotes and completing your job on time and on budget. Ask us about our senior discounts and let us help you install that new walk-in bathtub. A1 Choice Plumbing is your best bet for all of your plumbing, heating, gas fitting, sewer and water heater needs. 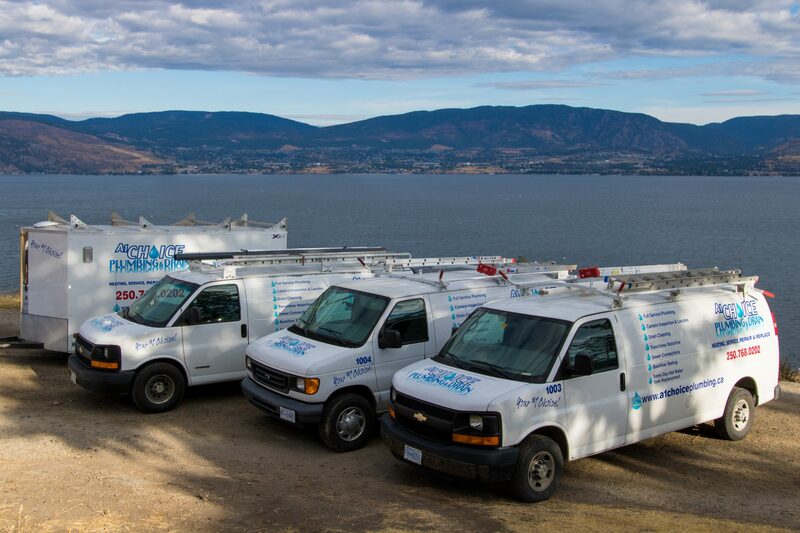 Fast, friendly and reliable, we are proud to serve the Okanagan Valley. Call us today to book your free estimate! Our expansive team is based out of Kelowna and West Kelowna; however, we operate throughout the Okanagan Valley. A1 Choice Plumbing is always happy to offer an honest, free estimate. Our fully licensed, bonded and insured crew strives to provide you with ultimate safety and peace of mind. Our office is located at 2470 Westlake Road, West Kelowna. A1 Choice Plumbing believes in giving back to our community. We proudly support the West Kelowna Warriors Hockey team. We also partake in the annual Golf Classic offered by the Greater Westside Board of Trade. We are thrilled to be actively involved with the Greater Westside Board of Trade. Additionally, A1 Choice Plumbing is affiliated with the Canadian Home Builders’ Association Okanagan branch. We enjoy networking within our community and working alongside other highly driven companies to make our city a better place. Water Bill Higher Than Usual? Here’s What Could Be Causing It. A1 Choice Plumbing & Drain Inc. Copyright © 2015 A1 Choice Plumbing. All rights reserved.